Our school horses are an amazing bunch. They run the gamut from show champions, to rescue ponies and everything in between. They all love their job and their home at Top Notch Farm. When Mazie first came to Top Notch Farm her new owner exclaimed "You can make me own her, but you can't make me love her!" It took only a few days before Mazie had wormed her way into that little girl's heart. Together they earned a number of championships in the pony hunters. Now that she's in her late 20s, Mazie is our resident "first pony." 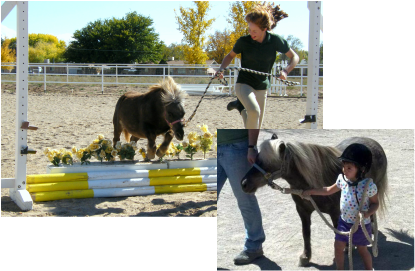 She teaches even the most timid of children to walk, trot, canter and jump with her even, calm attitude. Mazie even takes her students to the shows. 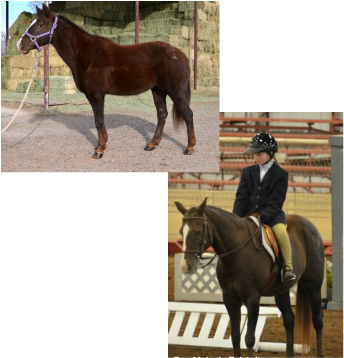 She'll go from a walk-trot class to the short stirrup with ease and looks good doing it. Jimmy had a hard life before coming to Top Notch. The scars on his face are from a halter that was too small, that was left on too long, and his tongue has scars from being wrapped with wire. When he first came to Laurie, he was green and a little upset at how he had been treated in his last life. Under Laurie's care he has excelled in his new life. Jimmy is our most bomb-proof horse. Nothing phases him. His only fault is that he is so slow! None of this has stopped him from excelling as a short stirrup pony. Jimmy not only teaches beginner riders the basics, he has won numerous championships with adults and advanced children aboard. His unflappable attitude makes him a great choice for a rider who is feeling a little timid, and his bold jump makes him a favorite for the kids who want to show and win. Jimmy is an amazing pony with a huge heart and a huge asset to our program. 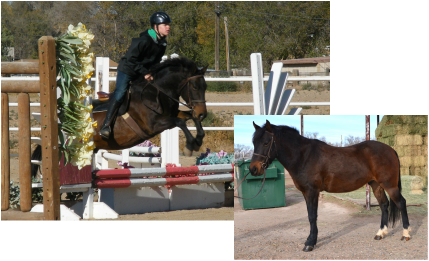 Several years ago, Laurie happened across a racehorse who was skinny and unhappy. An injury to her hind hoof had ended a successful racing career, and her owners didn't see the value of taking care of her now that she couldn't run. But Laurie could see she something special and snuck her onto the trailer and back to Top Notch. Foxy started her retraining as a horse for Laure's husband Rod Bush, and quickly proved her worth. It wasn't long before Laurie snatched her away and made her into a full-time lesson horse. Now Foxy is fully retrained as a hunter and works hard teaching her students how to be soft and strong over fences. Because she is so forward and carries herself so easily, she is a favorite of our intermediate riders. When Laurie needed another beginner to intermediate horse, a boarder offered up Henry and he joined our lesson program. Henry is a big sweet guy, with a big mellow attitude. It is hard to believe he started his life as a race horse. Because he is so calm and even tempered, Henry often works with the riders who have confidence or fear issues. He is equally at home teaching a beginner rider how to trot, or carrying a more advanced rider around a big course. When Foxy got swept into the lesson program, Benny became Rod's mount. That is until Laurie needed another beginner horse and started sneaking him into lessons. Laurie eventually bribed Rod with a jumper and made Benny a full-time lesson horse. In his past life Benny was a championship trail and western pleasure horse. It is no surprise that he went from jumping in a western saddle to jumping in an english saddle so smoothly. Along with Mazie and Jimmy, Benny carries our most beginner riders and smallest children. He'll work with our advanced beginner riders to teach them to jump and how to do a flying lead change. Our intermediate riders show him in the Pre-Adults. Like Jimmy, Benny can be a tad on the lazy side. And like Jimmy we adore him. Peanut is our miniature horse. While he is a little too small to ride, he lends a hand entertaining visiting toddlers and just being adorable. Occasionally we put a harness on him and attempt to teach him to drive. But mostly he is just cute. When Timothy arrived Laurie announced loudly and several times that he was not staying. A friend snuck this pony into the trailer when Laurie went to pick up a horse for a client. Despite desperately trying not to, Laurie fell in love and this pony has been in our barn ever since. He is a steady guy with a big heart and a comfortable jump.